I have finally finished Jeff Passan’s new book, “The Arm” and have a few pieces of information I found interesting. • When the ulnar nerve is brought in injury discussion people get excited. Here is why, “… ulnar nerve, a tube of fibers that originates at the spine snakes down the arm and controls fine-motor movement in the hand.” The nerve may need to be moved to get away from bone chips. • Also with Todd Coffey’s surgery, Neal ElAttrache states that the third party ligament used for Coffey will likely be a “little slower” to take hold in the arm. The point I took from this information is to find out if the ligament is the player’s or someone else’s which will take longer to heal. • Theo Epstein mentioned “left-handed pitchers age better”. 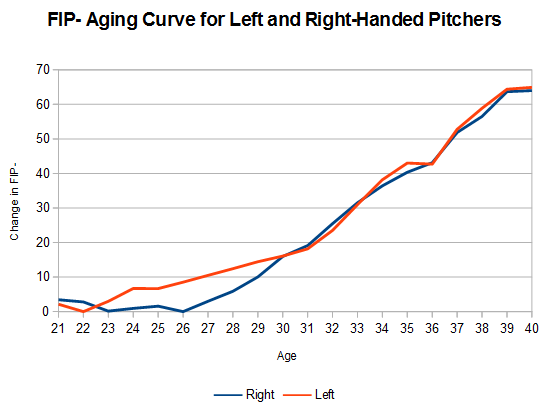 I love me some aging curves, so let me find out. Here are the FIP- and ERA- aging curves from 2002 to 2015. 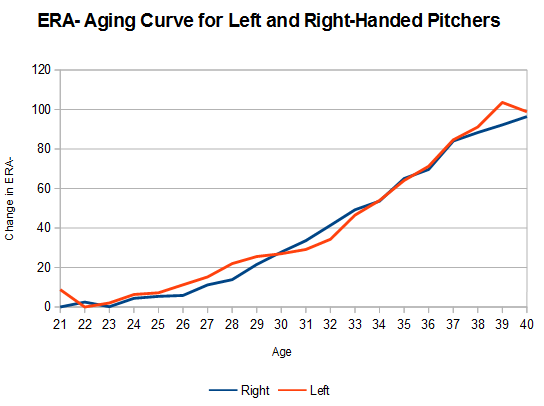 The idea of left-handed pitchers aging better seems to me to be an old wives’ tale, something Epstein made up, or my data is wrong. • As players come back from the surgery, they start throwing at increasing distances. It seems like this routine is done this way because it always has been done that way. • As with about any book, I found myself with some additional reading. I would recommend at least getting the highlights from these three articles by Dr. James H. Buffi on arm stabilization. He work was so groundbreaking, the Dodgers quickly hired him and his new work is no longer publicly available. I have not been able to find this article, so if anyone could point it my direction that would be great. • A study by Wiemi Douoguih is mentioned which looked at 250 pitchers and if the dreaded inverted-W caused more pitcher injuries. I am not a mechanical wizard, but the early trunk rotation means the arms are behind the trunk when the trunk begins to rotate. • In this article mentioned in the book, Kyle Boddy predicts that gaining 4 mph on a pitcher’s fastball may add an additional win’s worth of seasonal pitcher production. We hoped you liked reading Thoughts on Jeff Passan’s Book, “The Arm” by Jeff Zimmerman! I thought this book was excellent. As a Cubs fan the chapter on Lester–and let’s be real, it is mostly about Theo–is superb behind-the-scenes. The investigation and analysis Passan provides regarding different cultural beliefs on arm treatment is very good. I highly recommend reading it.